Recovery of Corrupted, Deleted, Formatted data from a flash drive is conveniently rendered by USB Pen Drive Data Recovery Software. The application can Retrieve & Restore videos, images, documents, etc. from a Pen Drive or a USB Flash Drive effortlessly. 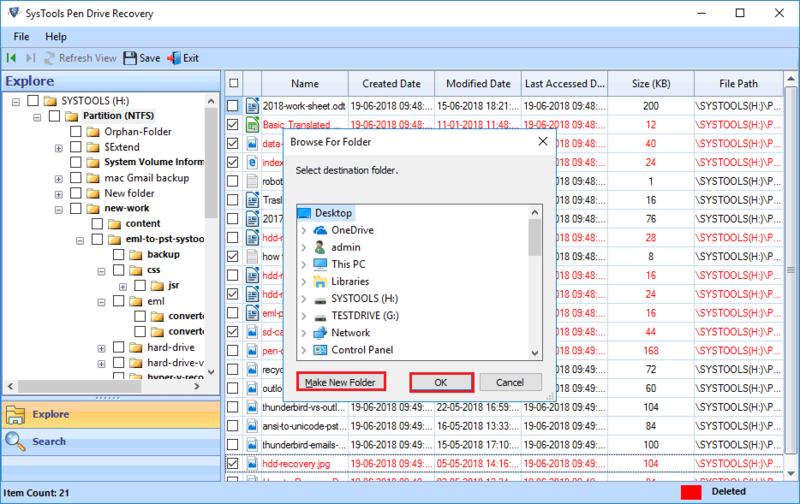 Pen Drive Recovery Tool can recover data from FAT 32, FAT 16, ExFAT , NTFS File System & Cross-Formats between NTFS & Other Formats like FAT16 & FAT32 formats to recover data from a USB. Thumb drive data recovery software is programmed in such a manner that it renders a guaranteed recovery no matter what the case is. You can recover your pen drive from any type or intensity of damage caused onto it with Pen Drive Recovery Tool. USB Flash Drive Recovery allows to recover external Drive data in two modes. The Scan option provides a quick scan of data in Pen Drive, and previews deleted and corrupted data files in Pen drive. The Formatted option is time consuming process, which parse the entire Pen Drive and recover lost data in USB Pen Drive efficiently without causing any data loss. This help user to recover Raw Data (ZIP,JPEG, GIF, PDF, MPEG LAYER – III, PNG, DOCX, PPTX, XLSX, WAV, AVI, BMP) from Formatted Pen Drive. This USB Data recovery option helps to recover complete data from a Pen Drive and restore it in the desired location. The software scans Pen Drive and load entire data present in it. The software allows to preview and provide save option to store USB data in any location required. With this recovery mode, one cannot recover deleted files and folders in a Pen Drive. It is possible that, important data stored in a thumb drive may got deleted by mistake. This Pen Drive Data Recovery software can recover permanently or accidentally deleted files and folder from Pen Drive after scanning the thumb. 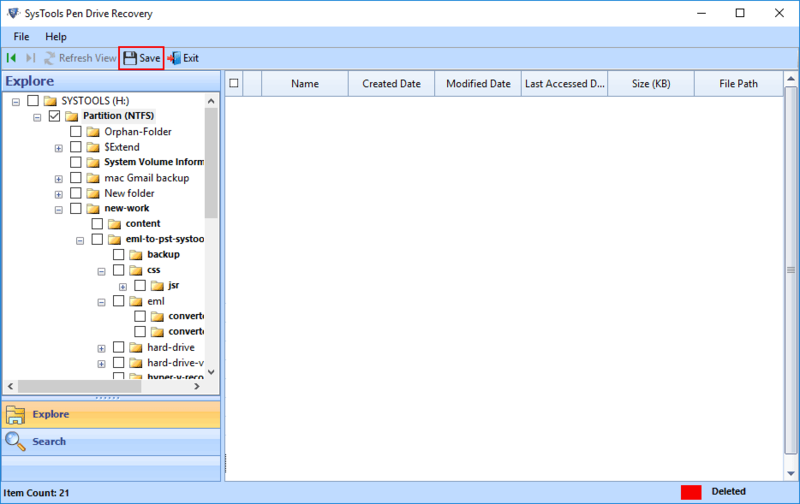 The utility will provide a preview of deleted files in Pen Drive and allows to save those files in required location. Formatting of USB drive helps to clean a Pen Drive when it gets corrupted. Formatted Pen drive will be free from corruption and virus, but it cause loss of crucial data from the drive. This Pen Drive Recovery tool can recover formatted partition data from USB drive efficiently. A powerful search option is featured on the USB Pen Drive Data Recovery Software panel to allow users extract particular items accordingly. Furthermore, the Software additionally features an advanced search option too, which enables searching for an item within the search result. The well-programmed software recovers data from FAT and NTFS file system Pen Drives effortlessly. The tool can recover data from a corrupt, deleted, or a formatted Pen Drive in a professional way. Integration of the sophisticated algorithms in the software helps recovering data from USB drive successfully. User interface and panel of the software are designed in such a way that it allows selective Pen drive recovery. 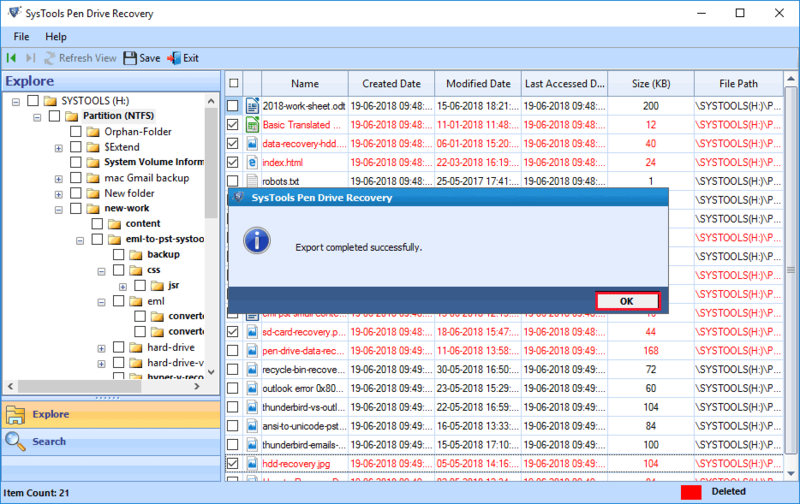 Extract Selective Data files and folders using the check boxes provided against items recovered via USB Drive Recovery to perform a customized restore of data as per your convenience. 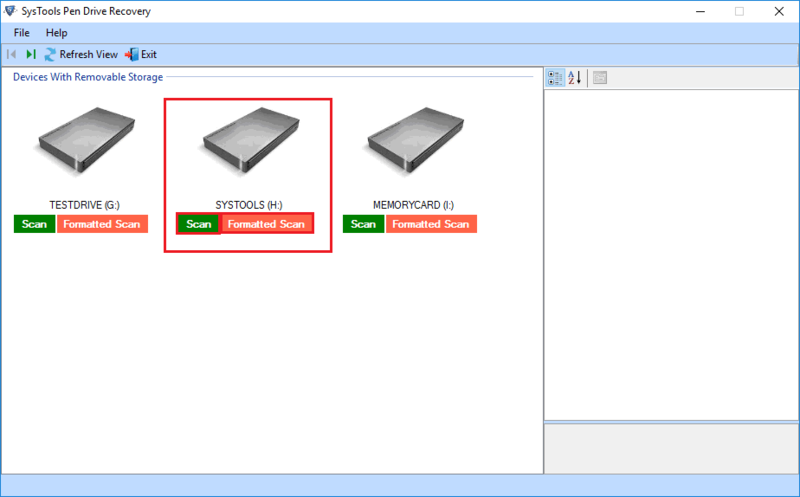 The flash drive recovery software is designed to render recovery but with consideration for user convenience. A preview of Pen Drive data is generated before USB data recovery so that the restoration of data files and folders is done selectively according to preference and assurance of the user. Pen Drive Data Recovery Software is a Windows based product, that can run on all versions of Windows OS efficiently to recover corrupted, deleted, formatted data files in USB flash drive or a Pen Drive without any data loss. The USB Drive recovery software has many features that allows user to trust on its service. 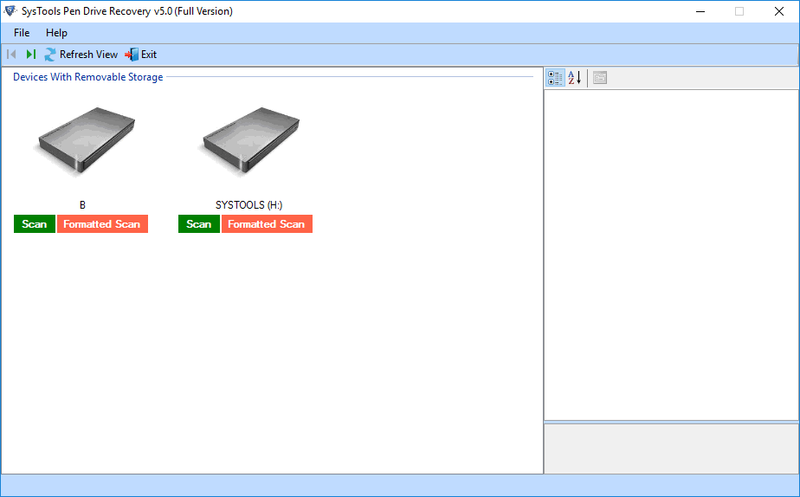 SysTool Pen Drive Drive Data Recovery Software supports almost all brands of Pen drives and USB drives to recover deleted data. It supports brands like HP, Sony, Kingston, Sandisk, Moserbaer, Sungsung, Lg, Transcend, Toshiba, Adata, Corsair, Lexar etc. How to Work With Pen Drive Data Recovery Software? Step 1 : Click on the Start menu button » Programs » USB Pen Drive Data Recovery. 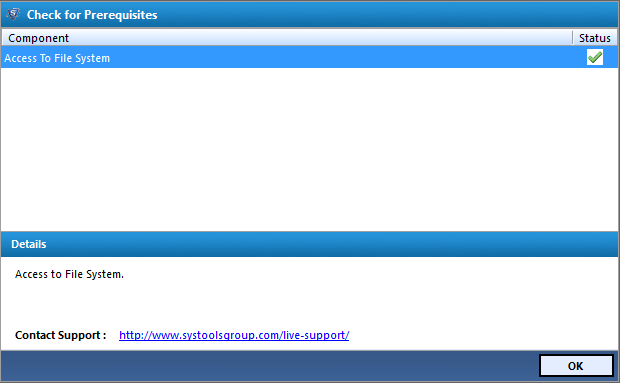 The tool will show you a screen "Check for Prerequisites". 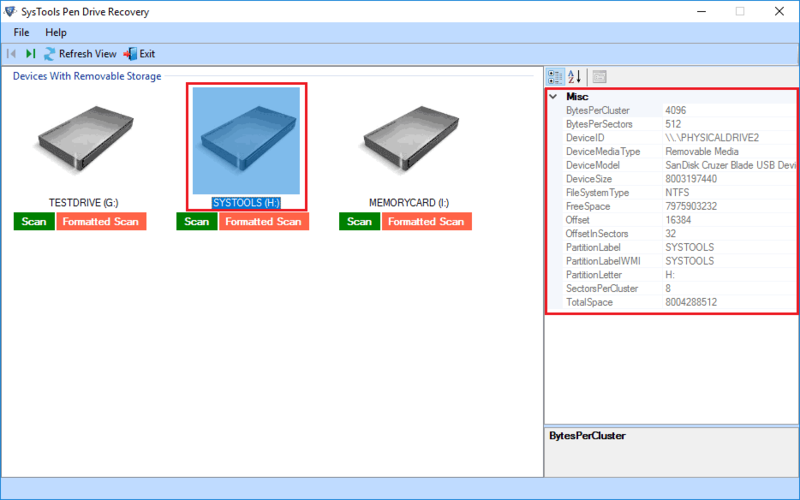 Step 3 : Tool provides a 'Refresh View' option, which helps to view newly attached Pen Drive/ Memory Card without closing the software. Step 4 : Select the required drive from the listplayed on Software windows. 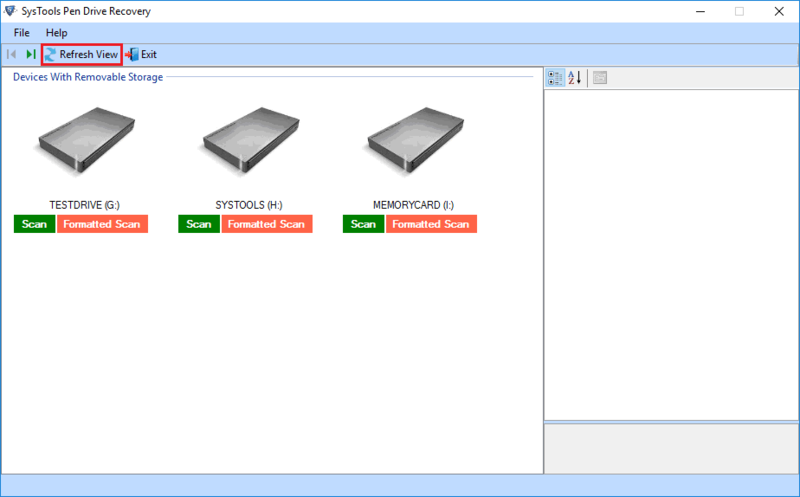 Scan: Select Scan for Deleted & corrupted data recovery from drive. Step 6 : The Flash Drive Recovery Tool scans pen drive for: currently engaged bytes and Assigned files, giving you details on the partition chosen by you, total used size, counts of bytes software is successfully restoring, recovered folders, counts of total number of files recovered within all folders. 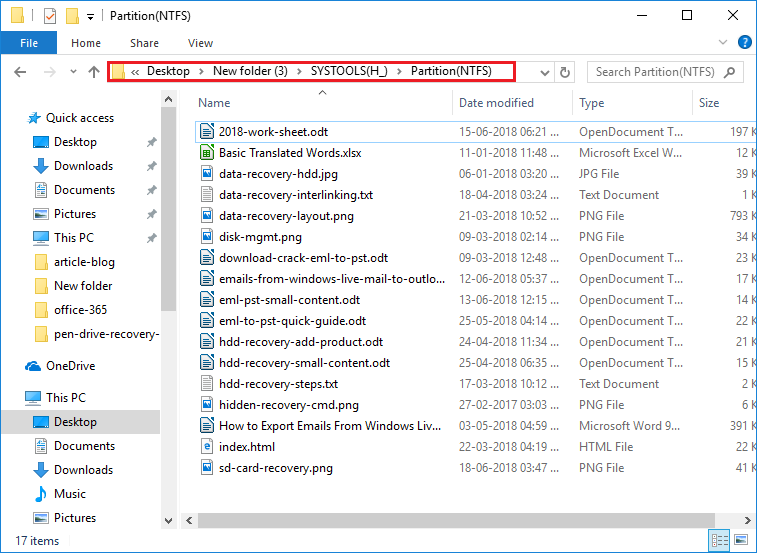 Step 8 : Create new folder by hitting on Create New Folder button and click on OK to save files in required destination location. Step 9 : View prgress report. Click ok when it completes. Step 10 : Go to the destination location. 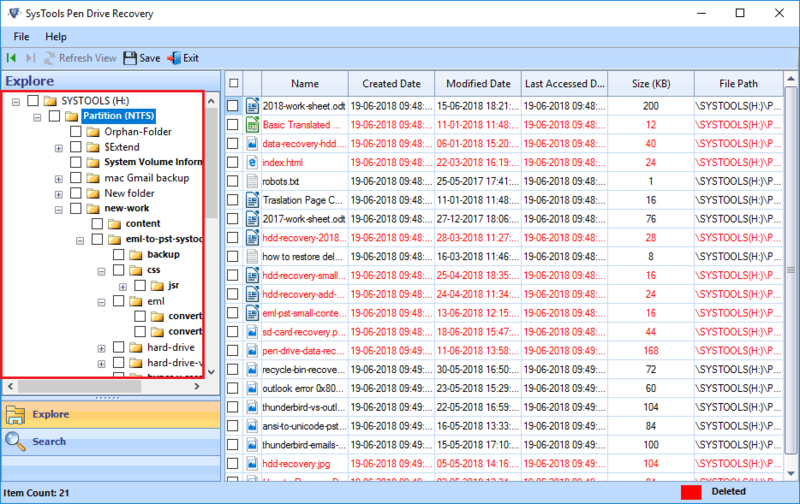 View the recovered files and data from Pen Drive/ Flash Drive. Q. How to get back lost data from pen drive if disk check fails too? Ans: If nothing works for you, download and install USB Pen Drive Data Recovery Tool. The application is built to recover data files from pen drive whether corrupted, formatted, or cleared off permanently. Q. What to do if pen drive loses all its data to recovery via command prompt? Ans: You can use Flash Drive Recovery Tool to recover lost data from Pen Drive. If you know exactly to what you lost your data to, you can also choose the mode of recovery for a precise processing of data. However, in miscellaneous recovery cases, you can simply go for normal data recovery from a USB Drive. Note: Pen Drive Data Recovery Software will get delivered on your registered email id, within few minutes after placing the order. There were plenty of options for me choose from while looking for a USB Pen drive data recovery Software. However, yours was the one that seemed like the perfect one and it proved to be one too with the recovery of all my lost files from a Kingston 32 GB pen drive. Thank you Company, if it wasn’t for you I would have never got back my Smart Phone backup. My entire backup saved in a HP pen drive was lost to an accidental formatting, but thankfully the USB Data Recovery Software was suggested by a friend which turned out so well.